The loneliness of those of us who have spiritual eyes to see in a world walking around looking through rose colored glasses, is sometimes overwhelming. The world goes on just as it always has. Even Solomon lamented over how all things remain the same and even repeat just as they always have. When I read his words in Ecclesiastes, the diluvian time period or just prior to the flood comes to mind. The world was fully corrupted with nothing preoccupying them but only the thoughts of evil. They were indulging in unnatural affections with strange flesh (fallen angels), marrying and having children just before God’s judgement came destroying the whole earth. So it is today…the “earth-dwellers” are indulging in unnatural affections with strange flesh and having nothing but evil thoughts dominating their minds. 2 Timothy 3:16 speaks of this future generation as “lovers of self, disobedient to parents, etc. “These earth-dwellers do not learn from history or acknowledge that God is creator and Sovereign Lord over all life and judges all things: creation, nations, mankind and yes, even angels. These “earth-dwellers” do not contemplate these past judgements as reality because they have chosen to put their heads in the sand and live as “occupiers” of this forlorn land. The truth of all this was given them each even as unreasoning babes once they entered the world. (See Romans 1) Yet they turned away seeking and saying instead, “We will be like gods.” This is not an exaggeration. I think even in my own life prior to submitting to Christ Jesus, I’ve tried to be my own god. But there are some more tangible things that are presently going on here that you should be made aware. We should educate ourselves into the things that present day geneticists are doing with the human genome. Some have actually been quoted as saying once they accomplish their goals then, “We will be like gods. ”They are actually mixing human and animal DNA to create interesting human hybrids that will maximize strength, intelligence and longevity. This sounds a lot like my family’s favorite television series, “Shield.” Unfortunately, this stuff is real. Many of these scientists justify this type of behavior as the next step in our “evolutionary” ladder. I ask you, what world are we leaving our children? And what happens to a man, who was originally created in God’s image, but has his genome manipulated to say, live forever? Is he a man anymore? Is he the creation of God or man? If he is no longer in the image of God (a human) but created with a concoction of beasts, computer created super humans, what then does this do for his/her qualification for salvation? Does this new individual even have a soul, spirit or conscience? Would allowing science to corrupt our DNA be a precursor to the “Mark of the Beast” technology? (See Revelation 13:17, Rev 14:11, & Rev 19:20). Can these new creations made outside God’s image, have the capability to repent and be covered by the blood of Christ? These are similar things that were occurring in the days of Noah (Genesis 6, Peter, Jude and many historically reliable Jewish books like The Book of Enoch, The Book of Jubilees, and The Book of Jasher – (which are all quoted throughout Holy Scripture) all mention the full extent of what was happening in “The Days of Noah.” We should remember that one of the signs we are to look for in the last days quoted by Jesus is, “But as the days of Noah were, so also will the coming of the Son of Man be. … “The most important thing is for you to not take this blogger or any other person’s word for these things but to be a studier of God’s Word for yourselves. Don’t let this day go by before you read the ENTIRE chapter of Genesis 6. Ponder it. Was there so sort of mixing going on and a new hybrid race born? And because of Jesus’ own words in Matthew 24 of what to look for in the end days, should we be expecting the same kind of things to go on again? My life seems to be drawn to that which seems to catch most people completely off guard. When I flip on the news and I see Putin, the Russian President, taking over parts of Eastern Ukraine & moving his troops and aligning himself with China. Literally, red flags go up. (Ezekiel 38 & 39) When I see the civil unrest in Syria, the chemical weapons and the threat to neighboring Israel…I think of the prophecy clearly stated in Isaiah 17 that has never been fulfilled. It is concerning the final outcome of the capital city of Syria: Damascus. You should know that God’s word has promised that Damascus will become a “ruinous heap;” “At evening time, behold, there is terror! Before morning they are no more. Such will be the portion of those who plunder Israel. And the lot of those who pillage us.” I ask you, what could possibly turn a city into a “no more” in one night? The reason your ears should perk up when you hear these things is because the bible tells us clearly what to be looking for so we can be spiritually prepared while warning others to do the same. How can I be sure it will happen as it portends? Because the Bible has accurately predicted the past. We should perk up when we hear the Islamic State is crushing everything in its sight. We should believe their own words, “Death to Israel, death to America.” We should turn our attention to the actions of Russia and how Putin is playing psychological war games off the coast of California with our navy and air force. But our daily news is not reporting these sorts of things. We should be praying intensely, repenting of our own sins, and the sins of this once great nation. We should be praying for our lost loved ones and what God would have us do to make a difference in this world. Our allegiance should no longer be to a political party, or a particular nation but to God and the furthest of His Kingdom. When I hear that the Persian King (i.e Iran) shout with fist in the air, “Death to Israel!”, “Death to America!” The hair on the back of my neck stands up. Yours should too. Why, you ask? After all, the majority of people these days rarely concern themselves with these things nor consider them relevant to their lives. It seems to them, that they should continue “to drink and be merry” having no idea that sudden destruction is upon them. Remember those nonchalant actions were some of the things going on when the sudden flood came. There is only one true root issue that ties Israel and America together and that is, we mutually share The God of the Holy Scriptures; Jehovah, Yahweh, Elohim, The Ancient of Days. We know our adversary, that great serpent – the devil himself, will stop at nothing to destroy God’s people. So when you hear these things – death to Jews and death to the Christians – you better sit up and resolve in your heart that you will stand firm when the fire comes. Satan is bent on our destruction because he knows his time is drawing near. He has apparently left the false religions alone. Pay attention. How many persecutions are happening in the Muslim community, truly? How about Hindus? What about atheists? In general, you will not hear of any unrelenting persecutions of any other religious groups other than Judaism and Christianity. There are many modern day “Noah’s” out there if we truly open our eyes and ears to listen to those God has ordained to blow the trumpet, per say. However; never ever take the word of a man over God’s Word. This is why it is so crucial we are filled with the Holy Spirit and drenched in the study of the Holy Scriptures so we can discern truth. 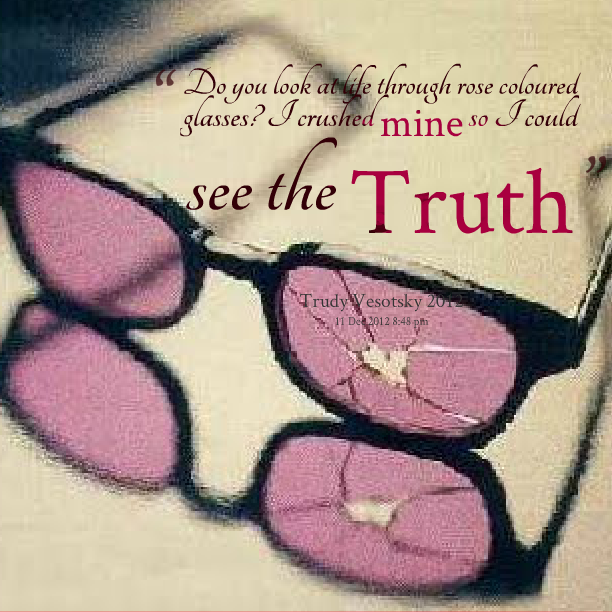 Maybe Noah felt like I do, wishing people would remove their rose colored glasses. You might be asking me, “Why are you being so negative!? We’ve never seen destruction like this before! And it is true, Noah warned for one-hundred and twenty years never seeing one raindrop. He must have felt so isolated. I suppose when Noah’s family climbed in that protective ark and the hand of God shut them in, he was finally dispiritedly vindicated. But who really wants vindication at that sort of price? Vindication is gained, while being covered by a sick kind of sorrow. I truly believe that the things that Daniel was told to “seal up until the time of the end” has become unsealed. We, who are true believers, have a responsibility to look at what the Word says literally (unless the scripture defines itself differently), and take notice of the things going on. Stop and listen to the words coming from that newscaster, politician or king. Stop and pay attention to what the world leaders are saying. Pay attention to mission statements of the European Union and peace deals between the Palestinians and Israel. Watch how Russia, Turkey and Iran have all aligned themselves like never seen before but was predicted by the Prophet Ezekiel. Pay attention to the entertainment industry and their obsession with occultist symbols and satanic divinations. I feel like I’m living in the twilight zone, people. These things are scary but they ARE real. Who would have thought that modern day intelligent people would reduce themselves to the worship of idols and parading it proudly? Who would have thought even a few years ago that a statute of Baal/Satan would be erected and crowds of hundreds of people would line up to celebrate. Who would have thought just a mere two years ago – our White House would shine God’s covenant rainbow on the façade of our historical house, as a rebellious cry out to Him, “We will do it our way.” It is appalling. God will show us, if we ask with our whole heart these things. It will be frightening, enlightening, isolating and yet freeing. He will give us eyes to see and ears to hear. Many times throughout scripture (Matthew and Revelation), Jesus is quoted as saying, “Those who have eyes to see and ears to hear, hear what the spirit is saying….”Do you, see and hear what the spirit is saying? And if everything I am saying in this blog post is foreign to you – you must ask yourself, “Why?” Are you eagerly adopting trends from this world, and learning tolerance at the risk of “tossing away” God’s standards for life? Are you living your lives to be noticed, recognized, loved, and esteemed by others? What are your TRUE motives during your earthly living? I would love to hear your feedback & please, share this blog with others. God is warning this nation and all the nations of the world. I will not be responsible for not doing my part to warn –even if that means I lose you. Go to my Website @ kimberlykmoon.com if you are interested in purchasing my book: Journal of a Sinner, Listening for that Still Small Voice. Thank you Kimberly. Such dire truth. Thank you, Kim, for passing on the message.